How to heal your MS goes far beyond getting a prescription. It involves reviewing and transforming the core factors that caused the MS to be expressed in your body. In this first session of the series Creating Health, we begin to detail how to heal your multiple sclerosis by addressing and healing those core factors – the physiological factors, such as food, toxins, gut health and lifestyle and the psycho-social factors such as trauma, emotional repression and insecure attachment styles. To begin to understand how to heal you MS, we must understand the type of disease it is and the best strategies in modern medicine to address its cause. Multile Sclerisis is a chronic disease. Chronic disease are non-viral diseases that have lasted for more than 3 months and cannot be cured by medicine. 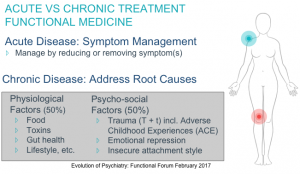 These are ‘life style’ diseases and to treat them, we must address the life style factors behind them rather than focus on just manage symptoms. By addressing both the physical factors and the mental factors behind multiple sclerosis, we have the greatest chance of reversing the symptoms of MS. It is not the traumatic event or experience that we had in childhood and early adulthood that causes mutliple schlerosis, but the beliefs or behaviors created from those experiences. By addressing and transforming these personality traits, we can reduce the internal pressures and stressors in the body and reduce the symptoms of MS.
One aspect that is important for the body to creating heal your MS, is the ability to relax and restore. The body cannot restore itself when it is in constant movement and responding to life. It needs times of deep relaxation, such as during a nap, meditation, relaxation or sleep. The physical factors behind Palmer Kippola’s multiple sclerosis included the development of leaky gut, gluten, lyme disease, cow dairy, sugar, mercury fillings, and genetics. By treating these factors, along with her chronic stress stemming from childhood, Palmer was able to reduce all her symptoms of MS and restore her health. The good news is that genes play an almost insignificant factor in MS.
Palmer used Alessio Fasano, MD‘s formula for reducing her symptoms of MS = treat the inflammation. These factors will be addressed in the following Creating Health presentations. In today’s presentation Palmer Kippola focused on food. 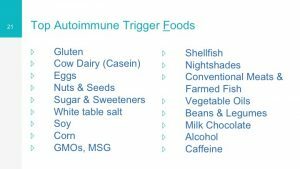 To begin to heal your MS by lowering the inflammation, you must first find the foods that trigger our system the most. Palmer Kippola recommends doing what she calls a food vacation. 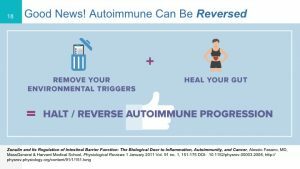 Spending 30 days without eating any of the main trigger foods and then incorporating them back into our diet one by one to discover which ones trigger inflammation. Doing a 30 days food diet gives the body sufficient time to repair and for us to determine if diet will help our symptoms of MS.
Palmer prioritizes the elimination of gluten. It was the main factor in her MS. She immediately noticed improvements by eliminating this food. This might not be the main trigger of your MS, but, according to David Perlmutter, MD in “Grain Brain: The Surprising Truth about Wheat, Carbs, and Sugar–Your Brain’s Silent Killers” to control our health outcomes through diet, even if we have a genetic predisposition to Alzheimer’s or MS, we need to consider the effects of grains in the brain. 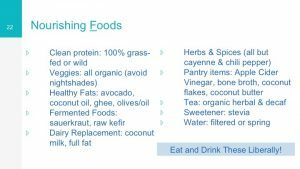 In his book, he also dispels the popular myths that a low-fat, high-carb diet is good and cholesterol is bad, and offers a simple path to prevention and even disease reversal. You can find more of Palmer Kippola’s work at healingisfreedom.com. Healing Your MS is part of the Creating Health Series. If you would like to receive these presentations as they are published directly in your inbox each month, please sign up for our newsletter. Don’t be left behind. There is help.